President Trump takes the stage after being introduced by Lee Greenwood. 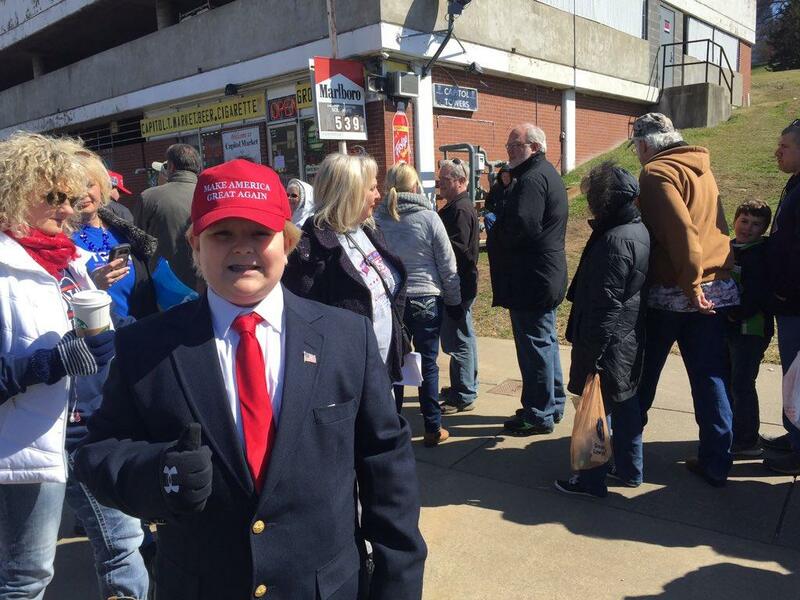 Trump supporters begin to line up outside Municipal Auditorium on Wednesday afternoon. 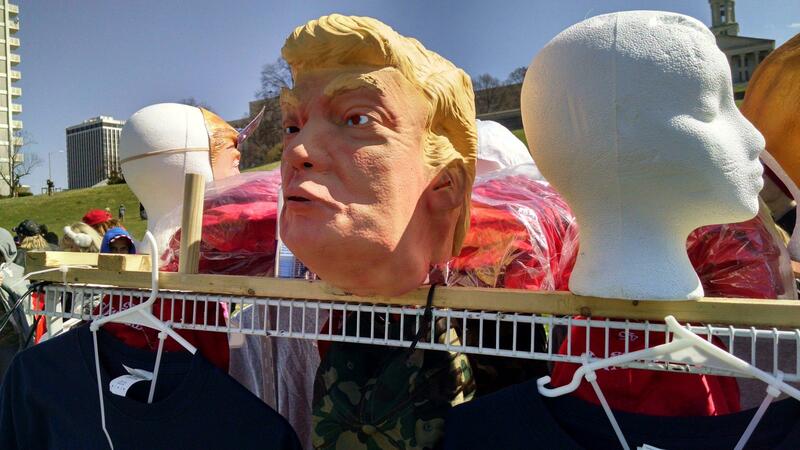 Some arrived as early as 6 a.m.
As President Trump visited Nashville on Wednesday, we followed along here with breaking updates and tweets from WPLN reporters. Update: 3/15/17 at 7:46 p.m.
President Trump spent a few minutes on the healthcare proposal making its way through the House, promising that doing nothing is not an option because, he says, Obamacare is failing. "Remember folks, if we don't do anything, Obamacare will be gone. What we cannot do is be intimidated." The president pivoted to only a mention of school choice, one of the topics he was expected to address, before ending his speech at around 30 minutes. Trump stuck to many of his go-to themes in this prepared speech. But he did bring up the breaking news out of Hawaii, that a U.S. district judge has blocked the latest immigration order just hours before it was set to take effect. He says the ruling "makes us look weak, which by the way, we no longer are." Trump on ruling: We're going to fight this terrible ruling ... all the way to the Supreme Court. ... We're going to keep this country safe. Trump worked in a mention of Hillary Clinton, and got chants of "Lock her up!" from the crowd. Update: 3/15/17 at 7:05 p.m.
Lee Greenwood sings his signature song "God Bless The USA" and introduces President Trump. Update: 3/15/17 at 7:00 p.m.
An announcement just came over the PA system that the president is in the building, but that there are still thousands of people outside waiting to get in and organizers are attempting to accommodate as many as possible. There are still plenty of empty seats, particularly in the upper level. The line for Municipal Auditorium is still past Rosa Parks. Talked to folks who were a bit resigned but said it was still worth it to come. "For me, honestly, I couldn't pass up the chance for President Trump, the person that I actually want to see the protests, to see it. I've been to protests before, but those were mostly just for other citizens. I want the president to know that, even though he's going in there and he's only going to see his supporters, that we matter just as much as they do." Update: 3/15/17 at 6:40 p.m. The Gatlin Brothers play their pro-gun anthem "American With A Remington" before launching into their biggest hit, "All The Gold In California," and then "America The Beautiful." Gatlin Bros. doing a good job of keeping the energy level up. It is going to take them a long time to get this arena filled. Update: 3/15/17 at 6:35 p.m.
Sen. Bob Corker is speaking, probably to kill some time since people are still trying to get into the hall. Corker, literally starts this way: "Lamar and I have had a wonderful day." So, yeah, this could take a while. Update: 3/15/17 at 6:00 p.m.
President Trump has a long line-up of opening acts. State Sens. Mae Beavers of Mount Juliet and Mark Green of Clarksville took turns applauding the new administration. Both were vocal Trump supporters during the campaign. Congressmen Scott DesJarlais of South Pittsburgh and Marsha Blackburn of Brentwood joined in the introductory remarks. Blackburn called Tennessee "Trump country." Homemade signs are not being allowed inside Municipal Auditorium, but these are being handed out. Update: 3/15/17 at 5:35 p.m. Hear a story about the long lines waiting to get inside of Municipal Auditorium. President Trump's motorcade has arrived in downtown Nashville, according to Scene reporter Steven Hale. Metro Police say the roadblocks have been cleared for now. 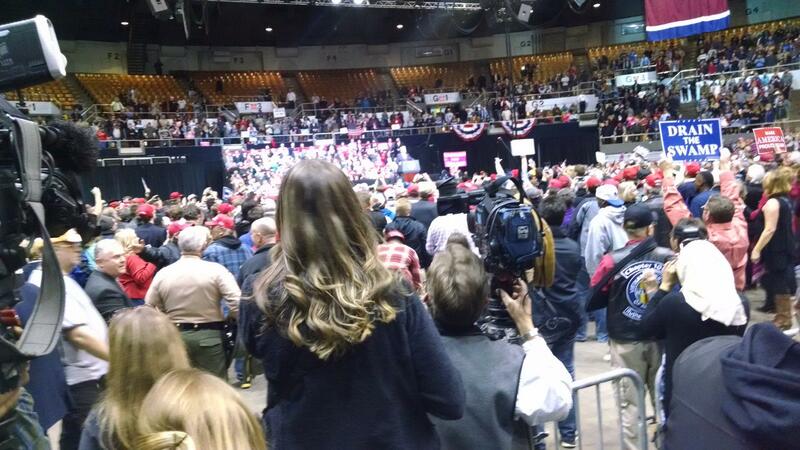 WPLN's Chas Sisk reports the Trump campaign may squeeze as many as 10,000 people into Municipal Auditorium, which can hold 7,500 in seats and perhaps 2,000 on the floor. "It has very much the look and feel of a Trump campaign rally," Sisk says. 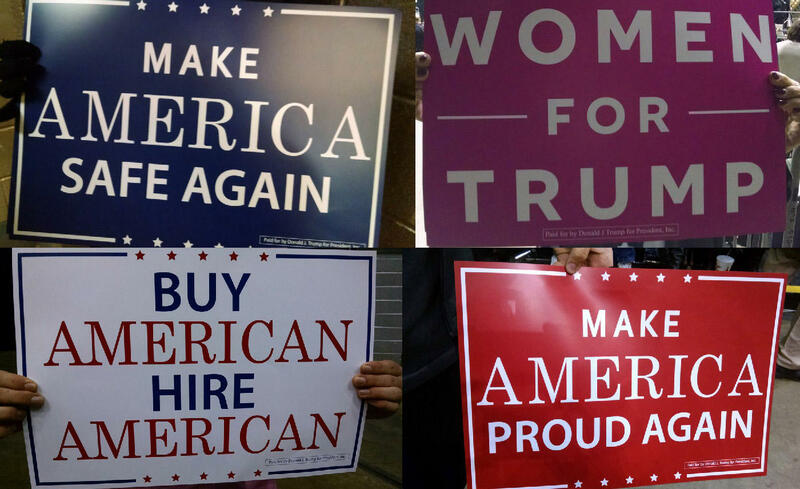 "Seeing a lot of the same signs, make America great again, drain the swamp, those sorts of things." 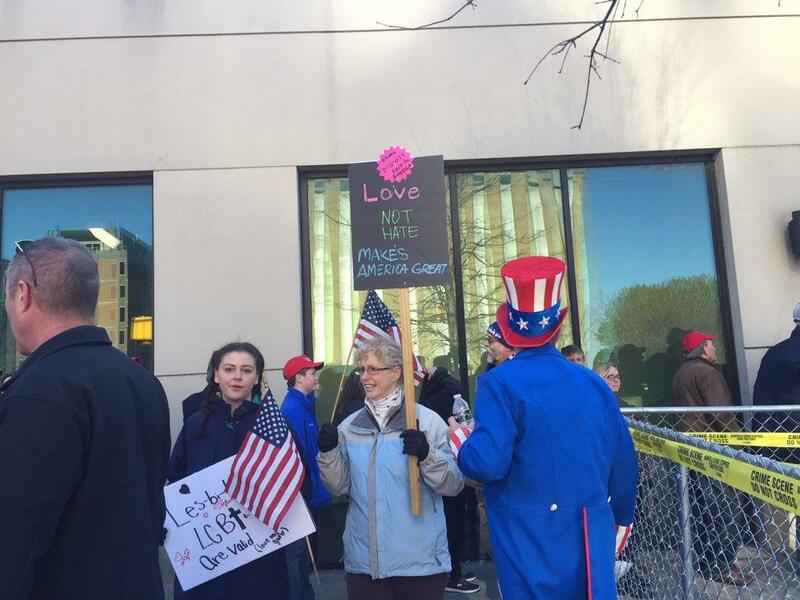 Protesters have gathered at the Metro Courthouse, but some are expected inside. Tennessean reporter Joey Garrison says they're being told not to get physical with anyone. 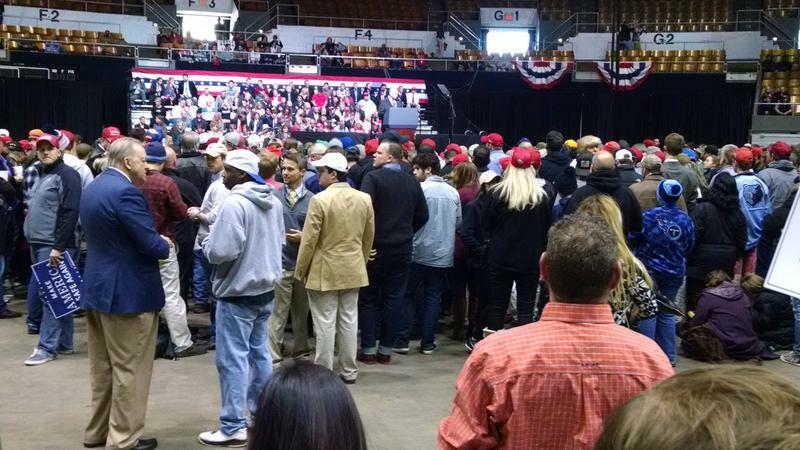 An automated message is playing at #TrumpRally telling people not to harm protesters in the crowd. 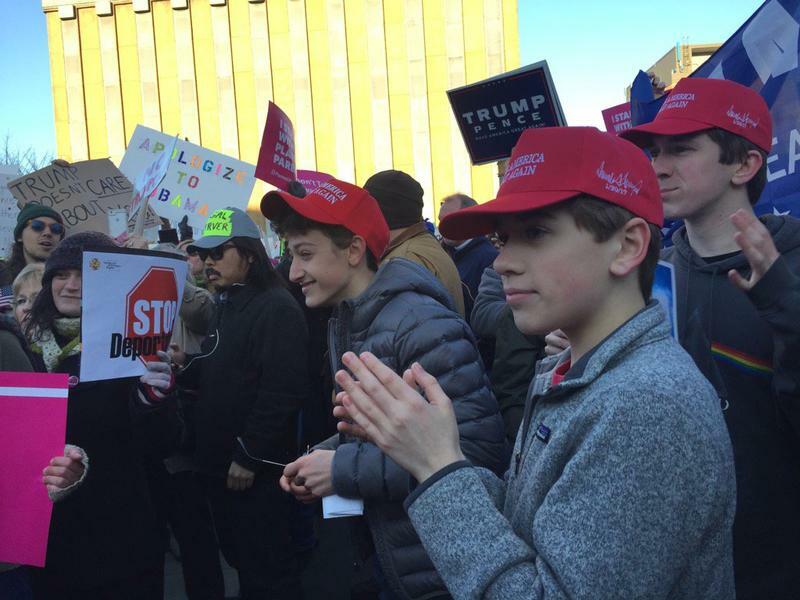 Instead chant, "Trump, Trump Trump!" Update: 3/15/17 at 5:05 p.m.
President Trump is expected to talk health care when he speaks at Municipal Auditorium tonight. Many in the room have advocated for an outright repeal of Obamacare, which is not quite what Republicans have proposed. Robert Easley of Murfreesboro is a Marine Corps veteran, and he doesn't like that under the GOP plan, the government would still be subsidizing more coverage, just through tax credits. "I'm a little more conservative than most, but I'm a little disappointed that he didn't just … I think you just repeal Obamacare altogether," Easley says. "I think it's been proven to fail. It's going to fail if he doesn't step in and do anything about it." He says he's a strong believer that health care is not a human right, but rather something the head of a household is responsible to provide. 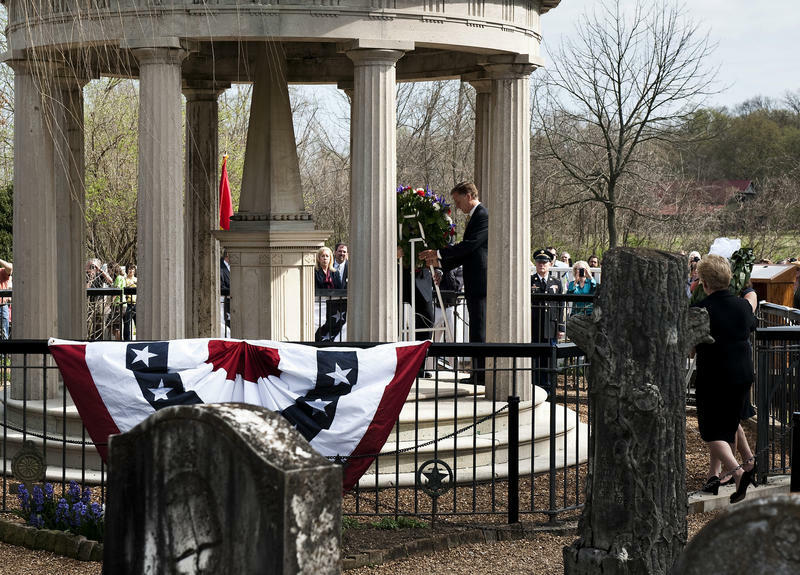 Update: 3/15/17 at 4:45 p.m.
As supporters and protestors gather in droves outside of Municipal Auditorium downtown, President Trump has been touring The Hermitage where he's just laid a wreath at Andrew Jackson's grave. That event is closed to the public. Update: 3/15/17 at 4:00 p.m.
Air Force One touched down at Nashville International Airport around 3:45 pm, and Governor Haslam was on the tarmac to greet President Trump and Sens. Bob Corker and Lamar Alexander. The two senators from Tennessee have been traveling with the president, accompanying him to Detroit before flying to Nashville. The motorcade is going next to The Hermitage where the president is expected to say a few words to Tennessee leaders, including Nashville mayor Megan Barry, and lay a wreath at Andrew Jackson's tomb. Update: 3/15/17 at 3:15 p.m. The line to get in and see President Trump tonight is pushing a mile long. It includes a wide range of people, including Akrem Hasan, who is Kurdish. He and his family came to Nashville in 1993. He says his two sons were excited to be in the presence of President Trump. 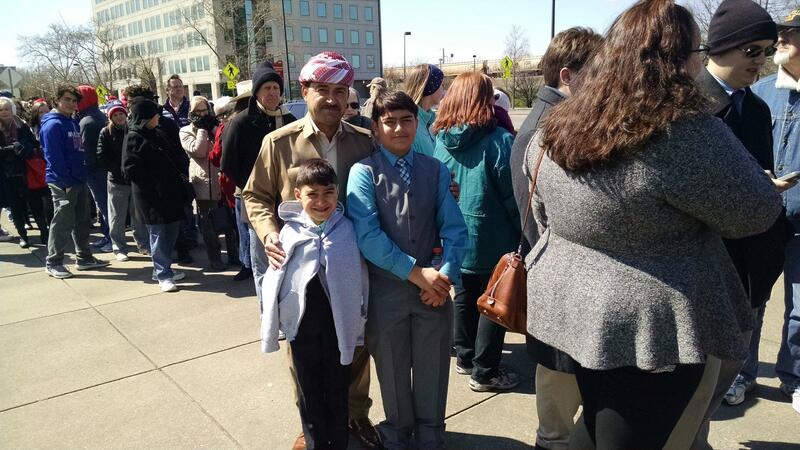 "We've been waiting for a long time to come and see him," Hasan says. "We hopefully ... will have a picture with him or to see him or we can just say hi." Akrem Hasan is wearing a Peshmerga uniform and brought his boys to see the president. Update: 3/15/17 at 2:45 p.m. 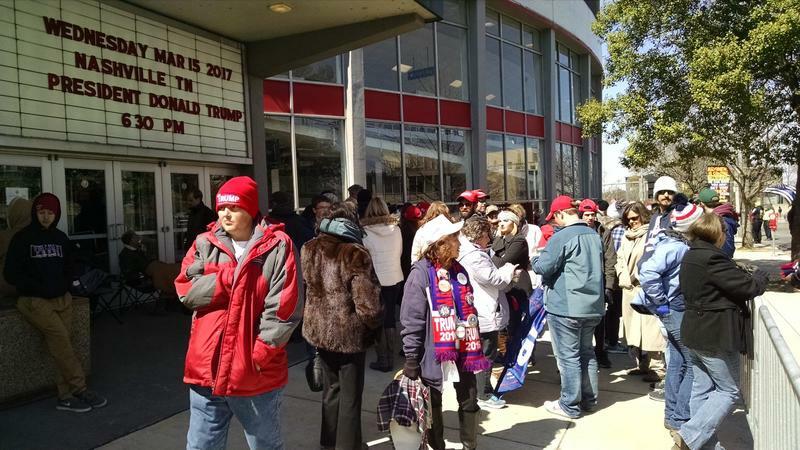 The line has already gotten long outside Municipal Auditorium, with more than three hours until the president is scheduled to speak there. 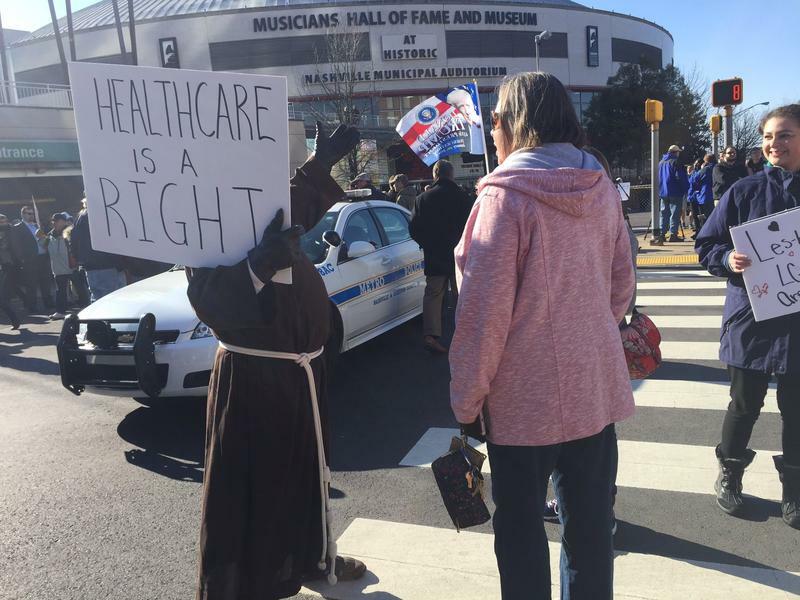 It's snaked its way down Rosa Parks Boulevard and is starting to circle the state Capitol. It's Andrew Jackson's 250th birthday, and President Trump is expected to be the first sitting president in 35 years to visit the Hermitage this afternoon before holding a campaign-style rally at Nashville's Municipal Auditorium. Merchandise is being sold on the street and supporters started arriving early, like Mark Vaughan from Knoxville and his son Jack. 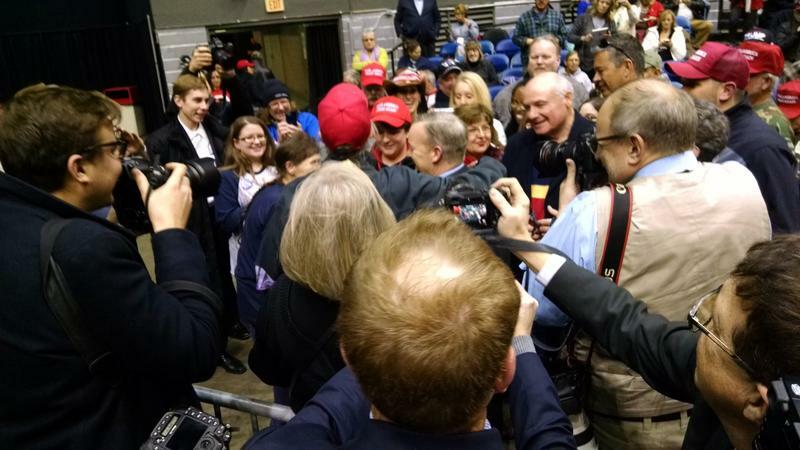 Mark says he saw Trump speak twice before the election, and they arrived at about 6 a.m. to hear him today. "I think just seeing the president is something you have to do at least once in your life, and I think seeing him in person is quite different from seeing him on the news," Jack says. 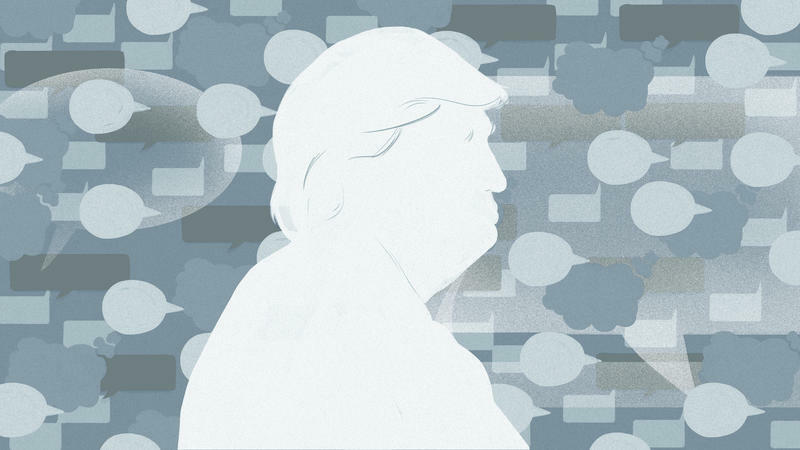 "You get to see what he says without the filter that goes through the media and stuff." Earlier in the week, there was speculation that Trump was planning his visit to Nashville in order to speak with healthcare executives about plans to replace the Affordable Care Act — the city is a major hub in that industry. But it's become clear that this isn't in the plans — healthcare execs have had to get their tickets online, along with the general public. Justin Mathewson was also in line today, waiting for a seat inside Municipal Auditorium. He's paying close attention to the healthcare proposal making its way through Congress, and points to specific areas where it's on the right track: buying insurance across state lines, pooling people together for cheaper premiums and health savings accounts. He feels strongly that Obamacare needed to be replaced and believes the legislative process should be allowed to work. He hopes the president can instill confidence at today's rally. "I hope he can reassure people. He's been pretty good at keeping his word so far, so hopefully the people, not just here but across the country — kind of give out the tenets so people may not hear the best parts of it through the media," Mathewson says. "He's usually really good about being able to cut through all the noise and lay it out how it is. So hopefully he can do that again tonight." Organized protests are also expected today — both near The Hermitage and at Municipal Auditorium. President Trump tweets a lot. With tens of millions of followers on Twitter, Trump proposes policy, shares his latest actions and reacts to the news. But 140 characters rarely give the full context. Here, NPR fact checkers attempt to do just that for key tweets. Curators at the Hermitage hope they'll have time to show President Donald Trump around Andrew Jackson's home when he visits on Wednesday. 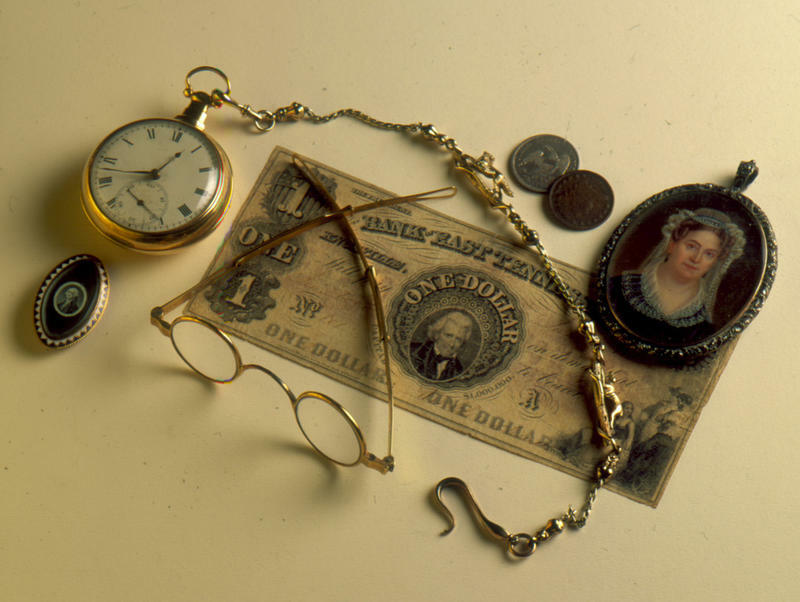 There's at least one artifact they'd like for him to see: a 230-year-old candle. 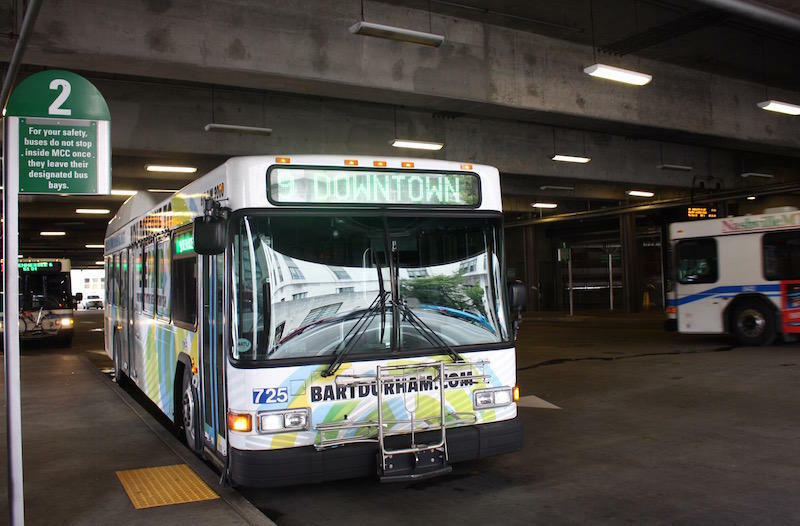 News of President Donald Trump’s visit to Nashville has lit up social media — including many commentators who are grousing about the impact to the city’s transit system. The Hermitage will have to close on what was expected to be a day of celebration for Andrew Jackson's 250th birthday. But the museum's CEO says they don't mind shutting down for the expected visit by President Trump on Wednesday, which will be the first by a sitting president in 35 years. The gathering was not quite as big as organizers would have liked, but a hearty crowd — wearing "Make America Great Again" hats and robed in red, white and blue — showed their support for President Trump outside the Tennessee capitol Saturday. 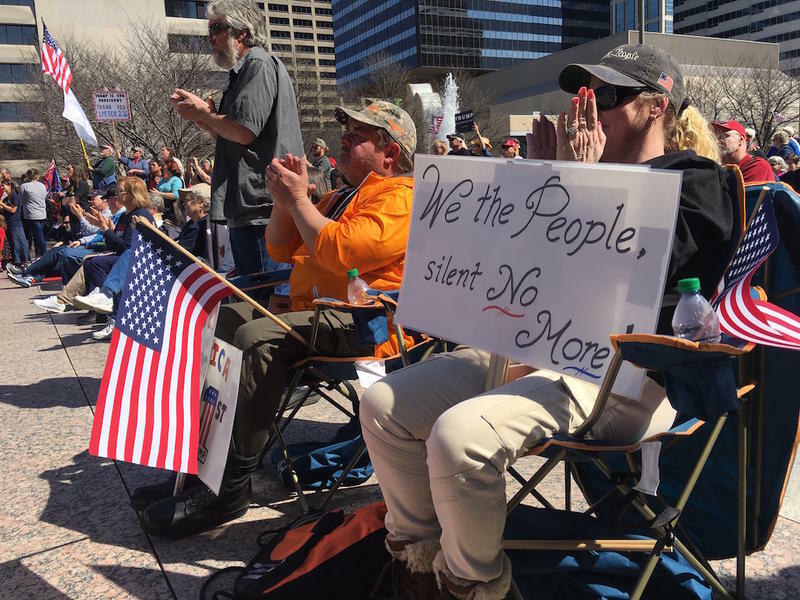 The event coincided with similar rallies in cities across the country, including Knoxville.